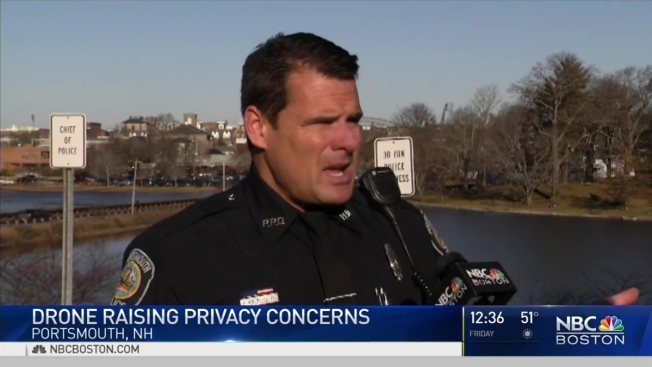 Residents at a Portsmouth, New Hampshire, apartment complex are looking to the sky after drones were recently seen 'peeping' over their homes. Two women in two different downtown apartments, in the same building, told their landlord that they saw drones hovering over their skylights. That concern prompted the landlord to seek out advice from police. “A lot of people have skylights in their bathrooms, if you take a bath, that’s kind of sketchy," said nearby resident, Lydea Irwin. “I definitely would not want someone spying on me in the bathroom." Residents at a Portsmouth, New Hampshire, apartment complex are looking to the sky after drones were recently 'peeping' over their homes. So far, police aren’t investigating because the landlord didn’t file an actual report. Siobhan Hyman lives downtown, and is concerned about drones invading personal space. People disobeying laws governing drones can face federal penalties and there are specific regulations in New Hampshire as well.